Poor Luke, stuck on his Uncle's Water Farm... servicing the condensers and having to help port the water about. Life was tough on that planet far, far away. Luckily, on OUR world, we have something similar which can help folks around the globe! Did you know that over 2.2 billion people around the globe do not have access to clean drinking water? And that women and children can spend up to 6 hours a day collecting and carrying water, often polluted, to supply the needs to their family? Water Seer provides an innovative solution to make clean drinking water available to a wider part of the population. Developed by VICI-Labs, in partnership with UC Berkeley and the National Peace Corps Association, the device relies on simple principles of condensation and is currently in a testing phase to finalize its design. The device functions by being implanted six feet in the ground, allowing the metal sides to be cooled by the surrounding soil. Wind turbines above ground spin internal blades that push air into a condensation chamber. This warmer air cools, creating a water vapor that runs down the sides into a collection chamber. 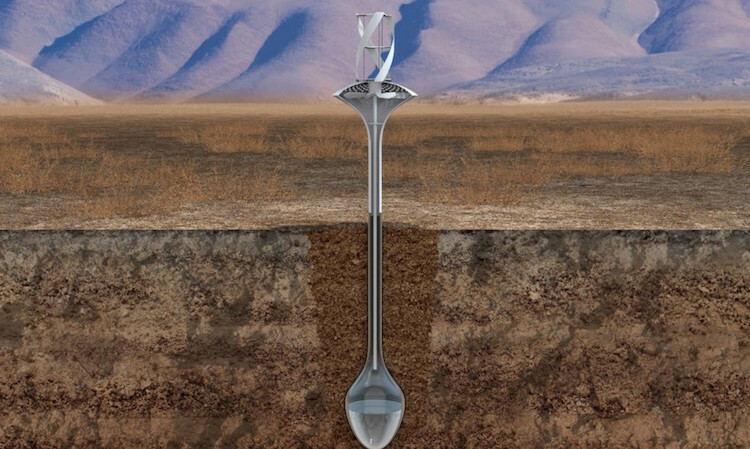 The water can then be collected with an attached pump and due to the fact that soil temperature is always cooler than outside air, Water Seer works 24 hours a day, even without wind. Field tests in San Francisco have yielded up to 11 gallons of water in one day, though actual yield can vary depending on the environment. The current prototype was designed with an aim of up to 37 gallons of clean water per day. The water collected is distilled, making it cleaner than tap water, regardless of air pollutants, and a filter on the device ensures that insects and debris do not contaminate the chamber. All this without using any external power supply. This could come in handy for those rugged survivalists too... being able to tap the moisture in the air & wind. Last Edit: 9 months 1 week ago by Kol Drake. The one unit the designer/manufacturer presents as of 'today' (( April 2019 )) is approx. $1, 400. Not quite at the level for 'generic homeowner use'... but getting closer. Now, if someone was hoping to go 'off the grid'... this would be a nice addition to a good water well. If I could go off grid, ie have my own home in the country, it would definitely be a item I would save up for. Thank you!